The Baja Blues Fest Organization is seeking approximately 95 volunteers to assist with the 8th Annual Baja Blues Fest at the Rosarito Beach Hotel, Rosarito Beach in August – the opening evening of 9th (Friday), the day of 10th (Saturday) and the afternoon of 11th (Sunday) 2019. 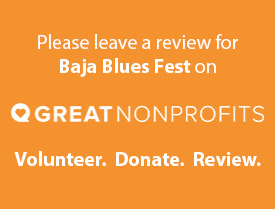 Volunteers must read and agree to the Baja Blues Fest Volunteer Information Sheet. To apply, please fill out the Volunteer Form and submit on-line if you wish to volunteer. You will have an opportunity to review your entries before submitting. Remember to click SUBMIT APPLICATION so that it sends us the application. You should get a Thank You Page from the Blues Fest if it was successful! By Checking this box I am guaranteeing that I have read the VOLUNTEER INFORMATION SHEET and agree to abide by the rules and regulations of being a volunteer and representing the Baja Blues Fest Organization. The Baja Blues Fest was formed to provide funding assistance to selected and vetted organizations that provide assistance to local children in the Rosarito Beach area. © 2019 Baja Blues Fest Organization. All Rights Reserved.